A will, sometimes called a last will and testament, is a legal document that tells your family and the state your intentions for your assets after your death. We recommend all our clients draft a will. This is true no matter how small your estate or whether or not you use other estate planning tools to distribute your assets. You choose who will act as the personal representative of your will. As personal representative, he or she will need to pay your final debts, appraise the value of any assets, calculate your tax burden, and distribute the remaining assets to your heirs according to the wishes you outline in your will. You will need to grant your personal representative certain powers that enable him or her to serve as your personal representative and handle the estate administration process. When we write your will or create other estate plan documents, we can provide the language for this section of your will. This is what almost everyone thinks of when they picture a will. You will outline what everyone gets after you pass away. You can leave everything to your spouse or children or split it between grandchildren. It is up to you. You can even opt to leave your entire estate to a charitable organization. Not all wills have this provision, but it is probably the most important part of your will if you have minor children. We can help you name a guardian who provides for their day-to-day care if something happens to you and their other parent. We can also put plans in place to secure their financial future with a trust or other estate planning tool. Finally, your will outlines how and when your assets will change hands. In most cases, they will transfer to your loved ones during the probate process following your death. If you do not have a will or other estate plan in place at the time of your death, you leave the State of Maryland and its courts in charge of determining what happens to your home, nest egg, and other assets. Any other states where you hold real property will also decide what happens to the assets you worked so hard to obtain. When your estate ends up in a courtroom with strangers making decisions about it, the outcome is truly unpredictable. Laws can vary widely from state to state, and each judge in the same state may even interpret them differently. The only way to ensure your family members and loved ones get the assets you want to leave for them after your death is to have a will or estate plan in place. In general, there are two types of wills: those that stand alone and those that support a trust-based estate plan. However, all wills need an personal representative who will enter them into probate and handle the entire process. The Maryland probate process can be expensive and time consuming. Your family members could be denied access to the money you left for them for months or even over a year before the process is complete. There are ways you can help your loved ones avoid the hassle and expense of the probate process after your death. Your first option is naming a beneficiary on any account that allows it. This allows for the transfer of these assets into your loved one’s name without involving the probate process. Alternatively, you can place all your assets in a trust. Trusts do not require probate and can allow for quick distribution of assets. 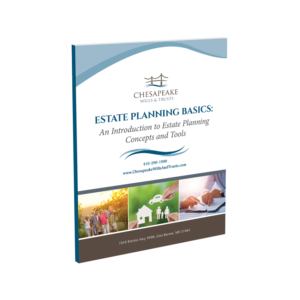 If you have questions or concerns about creating or updating your will in Maryland, the estate planning team at Chesapeake Wills & Trusts can help. No matter your goals or the complexity of your estate, our estate law attorneys can help you create a comprehensive estate plan that works well for you and your family. Call us today at 410-590-1900 or come to one of our community workshops to learn more.